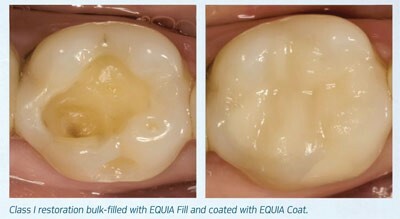 Glass ionomer cement is a kind of dental cement that was developed in 1965 and began to be used in restorative dentistry in 1972. Made of a silicate glass powder combined with a water-soluble polymer, these cements are also called “giomers.” They are used to permanently cement dental inlays, bridges, crowns and orthodontic brackets and to fill cavities. The cement is popular because it adheres to enamel and dentin and has the same natural color as teeth. In addition, glass ionomer cement releases fluoride ions, which are beneficial to the teeth. If traditional giomers are to be used in a higher-stress area of the mouth, they must be protected by an amalgam or a resin composite. This is sometimes called the “sandwich technique” because the giomers are sandwiched between the tooth and whatever restorative material is being used.